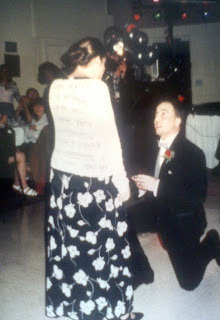 14 years ago on this very day I popped the question to the woman of my dreams. Thank you Mrs. Shife for being the greatest gift in my life. Thanks for stopping by, and I will talk to you tomorrow. Congratulations to you both. I like that you proposed in style, Matt. So romantic. I agree with Valerie, very classy. And it's nice you have a picture for memories and you're still madly in love 14 years later. Sorry I'm late but big congratulations and much love.